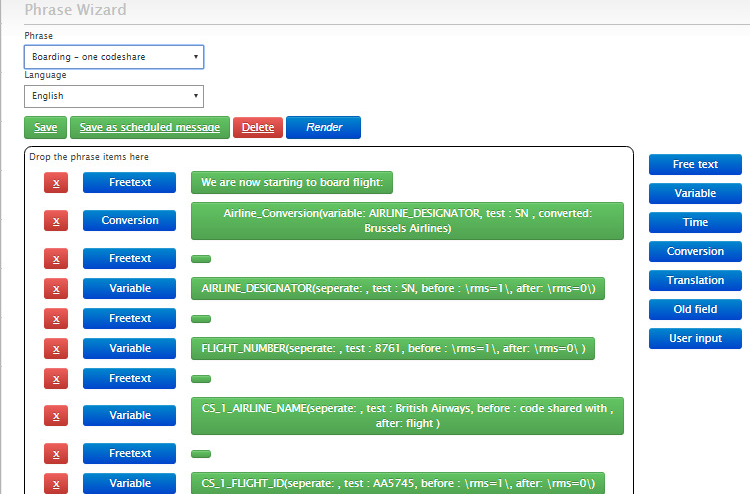 viasPAS is used to generate automatic flight announcements. AFAS is somtimes used as the short for this type of software. The software package is placed between the AODB and the PA system of the airport. The software is built as a true multiple airport program. announcements in gates and automatic announcements in flights etc. viasPAS can be used for any automatic passenger announcement in the airport. The system reacts immediately on any change in the underlying real time data. The data may come from any source like AODB or FIDS or even the airline’s own database. The phrases used for the announcements as well as the rules for the announcements may be changed at any time. The package has a lot of feature giving the customer the freedom to adopt the announcements to today’s requirements with a few mouse clicks. ViasPAS can be used for manual gate announcements. A web page, on the gate computer is used to trigger the announcements. The buttons and the phrases behind may be defined dynamically. Of course, the buttons may also be used to change the state of the flights accordingly. 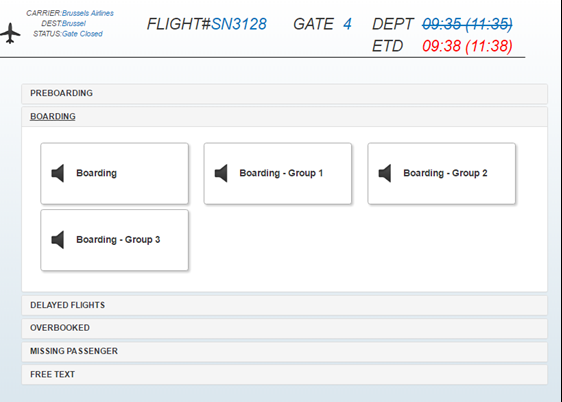 Note that the system automatically knows about which flight is on the gate and the status of the flight. By adding, a link to the different airlines database on can get a list of missing passengers with their names and nationality. This list can be used to make general calls for missing passengers in the language of the airport and in the language of the missing passenger. At the same time the list of missing passengers may be send to the viasFIDS system and be running as a ticker of a separate screen on any monitor in the airport. When a flight is approaching an airport, it is possible to send a list of connecting flights with gate assignments, delays and walking distance from arriving gate to destination gate in the language of the relevant passengers. Only the onward flights that are relevant to the passengers onboard is announced. To avoid sending audio files to the flight, a small-embedded computer is installed in the airplane and connected to the audio system of the airplane. This computer then makes the text to speech conversion. Instead of generating a text that is send to a text to speech translator program the text could be send out to either SMS or e-mail lists. The target audience for the alerts could be passengers that has requested information for the flight or it could be messages to different staff groups that has to be notified if there are any changings in the flight schedule. The possibilities are unlimited. In a normal PA system, loudspeakers are grouped in zones. The viasPAS also works with zones, but in a much broader definition. In viasPAS a zone is just a target program where the text should be send to. The target program may be a text to speech converter or be an e-mail or SMS distribution program or even a program that can send the information to a flight. The phrase in viasPAS is a string of text. The string is produced by concatenating a number of string elements that are edited in a smart web-browser based editor. The string elements can be one of: “Free text”, “Database variable”, “Database Time variable”, “Conversion database variable”, “Old value of database variable” and “User input”. One can edit a phrase by drag and drop phrase elements from the list on the right on to the message canvas. Rules are sql statements, that can be edited in a frontend. If the rule evaluates true the rule is true. Rules can then be combined with one or more phrase. Different languages can be assigned to the rule/phrase combination. All generated messages are logged. It is possible at any time to go back in the log and read the message and if it has been spoken, one can hear the result once more. 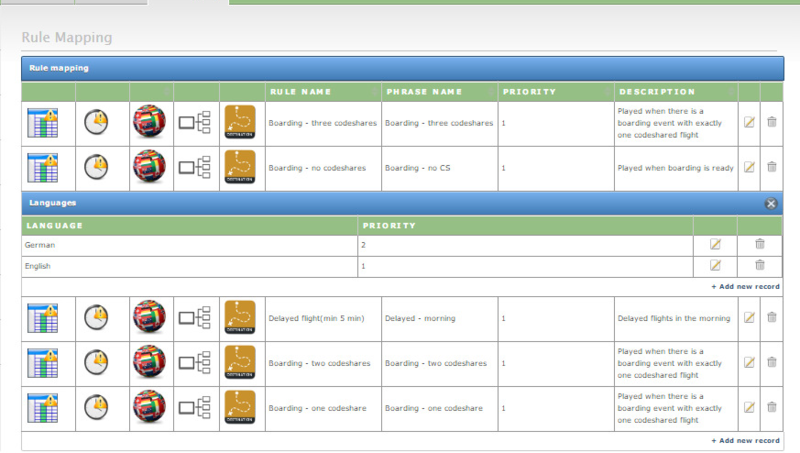 Easy Integration with all AODB and PA systems. A system that uses industry standard databases (Oracle). SMS and E-MAIL messages similar to and triggered by the same conditions as for the flight announcement phrases. 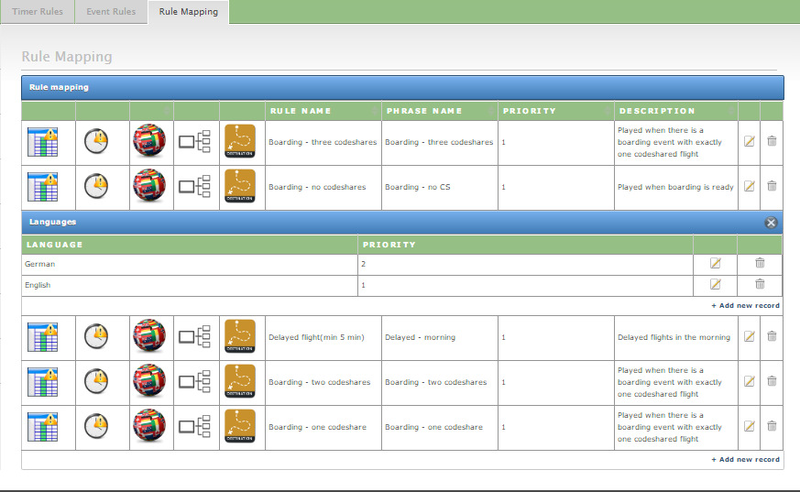 During installation we can deliver onsite skills for tuning and configuration of the solution. Controlled tests of all interfaces, phrases and conditions are carried out based on an of both parties agreed test protocol. Event driven solution with a small server footprint. Based on the industry standard and reliable Oracle database and programmed in JAVA.